Graham Pinney, Project Manager, Property Services Department, Goodman, contacted Lidoran Roofing regarding an issue with the Goodman factory building located at McCredie Street, Smithfield. There were water leaks coming from the roof and gutters, which were causing damage to the tenants stock as well as OHS issues with forklifts and slippery floors. Lidoran Roofing and occupational hygienist Noel Arnold & Associates were engaged to access any potential risks and format a scope of works. Due to the size of the roof and the logistical requirements of the current tenants, it was deemed too impractical and costly to replace the roof with the tenants in situ. It was therefore decided to coat the roof and gutters with a coating system provided by Astec Paints, NSW. 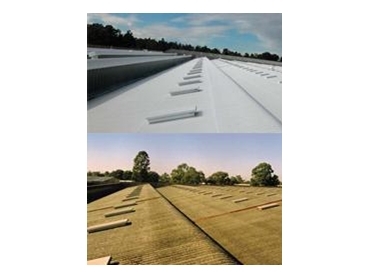 This coating ensures that the roof and gutter system are watertight for 10 years, and at the same time reduces the internal ambient temperature, due to the infrared heat reflective qualities of the Energy Star roof coating product. The heat reflective roof coating was applied by experienced trained applicators, requiring the use of specialised spray equipment. An air-driven coating system pumped paint up to 350m across the various sections. The surface preparation coat was applied first using Barrier, followed by a primer named Eco-Fresh Rivett. Next, 2 topcoats of Energy Star Tileguard were applied to fully cover the 56,000sqmarea in a crisp shade of white. Finally the gutters were coated with Energy Star EC100, Dirt Guard SM – developed to repel dirt and dust, and allowing water to pond without causing any problems to the integrity of the Astec product. All Energy Star products used on the project are environmentally safe due to their water based nature and contain no solvent.